Just curious, for the Meph team, why are we using Qilin instead of Katsu for crit buffs? Is it due to the need for a tank? Why Amano instead of Titanium Elf? Muchas gracias, esperaba la actualización con muchas ganas. Tengo cierta duda: No seria mejor llevar un “3/All enemies target” para llegar con mejor tiempo a la ola final? Porque asi veo dificil llegar con el suficiente tiempo para ejecutar los 2 combos completos que se supone que debemos hacer sin ayudantes. Ademas llevar doble Amanojaku solo te ahorraria un mana orbe al momento de ejecutar los combos al boss, de manera que con amanojaku helper: healer buff > crit buff > amano1 > amano2 > nuker> nuker> nuker> = 10 mana orbes. En cambio con el tiempo extra que te puede un “3/All enemies target” de preferencia con Buff para todo el team, puedes ejecutar 2 veces el combo completo con mayor seguridad usando casi los mismos mana orbes de esta manera: healer buff > crit buff > amano1 > amano1 > nuker > nuker > nuker> = 11 mana orbes. En resumen: con Amanojaku extra = ahorramos 1 mana orbe pero tenemos menos tiempo. con “3/All enemies target” tenemos más tiempo con el mismo daño efectivo por cantidad de mana orbes. What the are best helpers for each team? 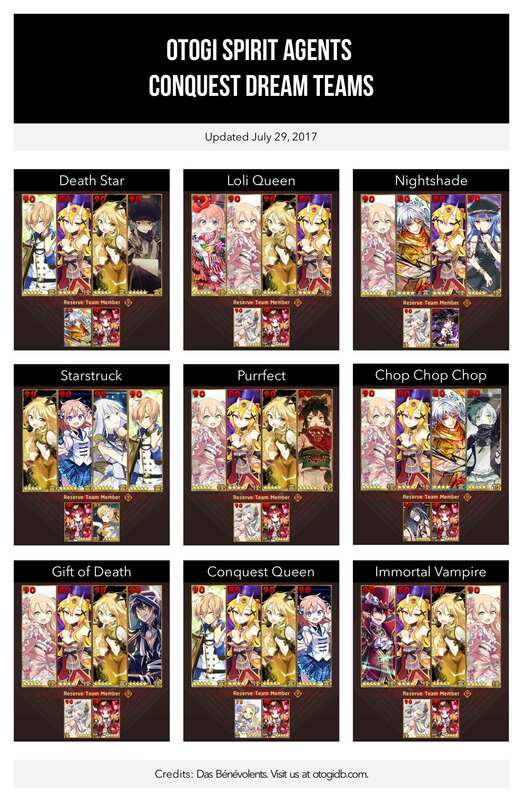 When will be daemon ranking (mlb) update? What’s the best skill order? dng buff – crit buff – debuff 1 – debuff 2 – debuff 1 – debuff 2 – nuke – nuke? Amanojaku can be replaced by Azi Dhaka, Rudy Red Nose, Daiji [Seductive Swimsuit], or even 3 star Magic Mirror (who does no damage but provides the greatest debuff after Amanojaku). So when using conquest dream teams, do you ignore the ranged unit or kill it at the last stage when the boss is melee just like what the past few conquest events had been ? Yeah, just ignore the ranged unit sitting behind the boss on the final stage. Otherwise (actually very frequently) where players are missing a piece of the dream team, a substitution to an AoE daemon is done instead, and that AoE daemon kills the ranged unit at the back. Can we stack Mephistoteles anf Amanojaku Poison? Or is it just to keep the poison on more fluently? Poison does not stack on top of poison. random question but why is that aurum lv80? The user most probably unlocked Aurum Elf’s Top Elf passive (85), and then sealed her (85 -> 80) for bonds. Philosophers is giving crit damage to everyone in set ups with decent crit chances (using Qilin’s buff). I assume it’s more suited to 2 combos in the time limit, aiming to do more damage in each combo and so the extra time isn’t necessary. Chrono’s will still work well, it just may need a different skill usage to maximise damage. Apollo’s harp replace Qilin will be more better in Faerie Dream team,right? Probably interchangeable. TNY is already providing crit damage, so the extra crit chance from Qilin is significant (50% vs 31% from Apollo). Overall they’re “probably” about the same.